When Philip II became king of the Spanish empire in 1556, he was arguably the most powerful man in the world. (Go ahead — argue with him, see what happens to you.) During his reign, Philip directed the construction of a truly wow-inspiring structure. 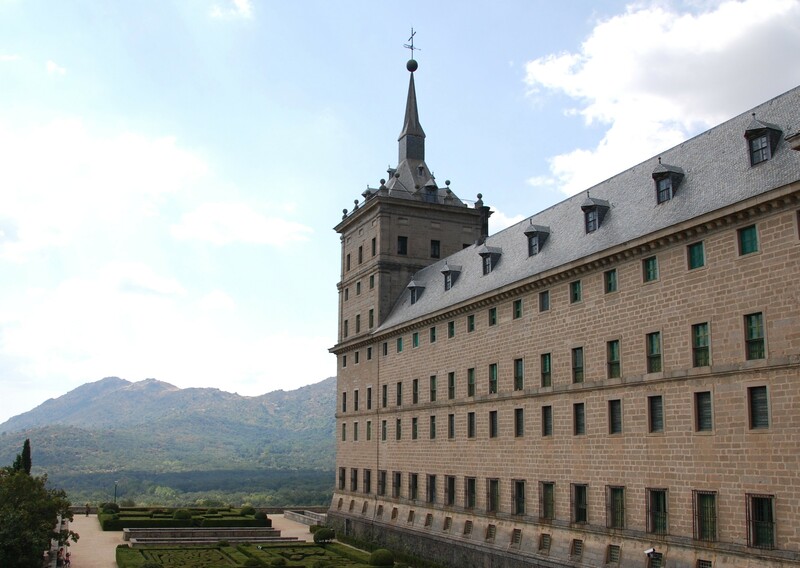 It is formally known as Monasterio de San Lorenzo el Real de El Escorial, but this great brute of a building is usually just called El Escorial. If you find yourself in Madrid, as we did recently, it’s worth a side trip to go see it. That may be so, but somehow El Escorial feels a lot more muscular than Versailles. Both have beautiful gardens and lavish ornamentation; the basilica at El Escorial is a tribute to the glory of gold (not a typo). Versailles doesn’t seem like a fortress, though, and El Escorial does. This was, after all, the headquarters of the Spanish Inquisition. Below ground level is the Royal Pantheon, the bronze-and-marble resting place of almost every Spanish monarch from Philip II to the present day. Their coffins are stacked on shelves in this octagonal chamber — kings on the left, queens on the right. Among the responsibilities of the monks who reside in the monastery part of the El Escorial complex is to pray for these deceased royals. One floor up from the building’s main entrance is the library, which will not remind you of the local branch of your public library. The vaulted ceiling is adorned with brightly colored frescoes, and the collection includes thousands of rare manuscripts and books, dating back many centuries. We noticed that the books were all shelved backward; that is, with the spines facing inward. The edges of the pages, all coated with gold leaf, were facing out. We had to ask about this unusual approach to storage, and the librarian explained to us that it had a couple of virtues: it allowed the pages to “breathe”, she said, which helps in their preservation. And according to her, the gold leaf repels bugs. Along with Versailles and places like India’s Taj Mahal, the Great Wall of China and the Acropolis in Athens, El Escorial is on the list of UNESCO World Heritage Sites. I’m pretty sure that designation doesn’t apply to the snack bar, though. My sandwich was just ordinary. Come to think of it, the one I had at Versailles wasn’t very good, either.